Whenever I pass by an Our Tribe store, I would always remember Dr. Janet Emmanuel from 3 years ago and her lecture on global translation of Filipino products, mentioning Our Tribe as a perfect example. She noted that Our Tribe sells shoes, bags, and other small leather goods with superior quality, but because of limited design, lonely store window, etc. the brand doesn't seem to catch a lot of attention. Dr. Emmanuel used to be the Academic Director of Raffles Design Institute - Manila. It was year 2011 when I met her at RDI during a workshop titled "Conversations on Fashion and Design". After hearing her lecture, I promised myself I will pay Our Tribe a visit and purchase a bag for myself. Years 2012 and 2013 came and passed, I lusted on a couple of bags from their online site, I did dropped by to every Our Tribe store I saw yet couldn't decide whether to buy or not. Fast forward to 2014, I finally bought a shopping tote so I'm doing this short review as requested by a friend. My first Our Tribe leather bag, ever. Close up photos of the bag's material, logo, inner pockets, and zipper. The brand logo tag and flower charm. This bag was a little over P4,000 when I bought it at Our Tribe in SM Megamall. Sorry, I do not remember the exact price but will go back to this entry and write the price once I found the receipt. Also, I am not particular with the model name or code of this bag, still waiting for Our Tribe's answer to my query. 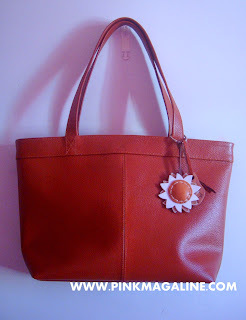 Anyway, let's just call it a classic shopper in chocolate brown color and hard leather material. This bag is called 676. That's how they name their bags in Our Tribe. They give numbers instead of a specific name like Neverfull or Selma or Nightangle. And, I remember now, I paid a little over P4000 for this bag because of the flower charm. The exact price of the bag alone was P3895. Thanks to Our Tribe in Facebook who kindly replied to my query. -It good as an everyday bag. I normally use it when I commute. -It is perfect for my size being a petite woman. -It can carry a lot of things from wallet, phone, and makeup kit to my daughter's nappies, breastfeeding cover, and wet wipes. 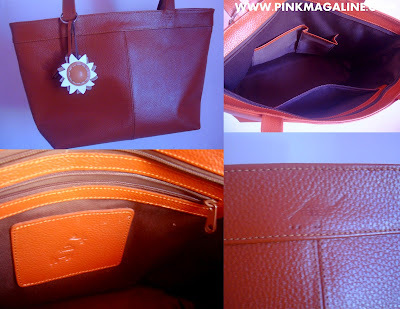 -Being a leather bag, it is affordable for its price. -No metal hardware so it isn't heavy compared with my other leather bags. -It is too plain so I had to buy a flower charm to add some "joy" to it. -The leather material is very hard. There is no way you can fold it. -The zipper makes the bag look cheap. -Inner lining is boring. I hope they consider using a printed material for it. Will I buy a bag from the same brand again? Yes! I am actually planning to get something in fun color. Maybe red? Thanks dear. You're right. They are not that popular even among fashion bloggers or celebs. Really? Which bag is it? How did you maintain the quality? Hi they offer candy colored bags and wallets though in limited pieces only. Got mine in eggplant (wallet) and pink (bag). Their products are simple and sturdy. Yeah, I hope they make more and more pieces in happy colors. I love them!